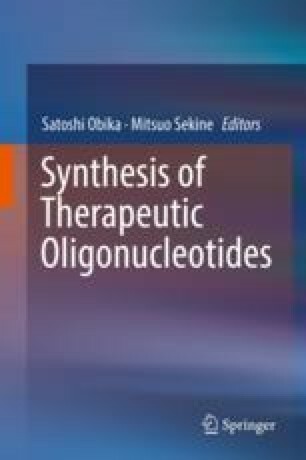 This review selects some representative coupling agents used for internucleotide bond formation reactions in the phosphoramidite method, which is now the most widely employed method for the chemical synthesis of oligodeoxyribonucleotides and oligoribonucleotides, and it describes their utility, efficiency, and drawbacks. Moreover, the mechanism of the coupling of the nucleoside phosphoramidite and nucleoside promoted by the coupling agent is discussed in some cases. The selected coupling agents are 1H-tetrazole, 5-ethylthio-1H-tetrazole (ETT), 5-benzylthio-1H-tetrazole (BTT), 5-[3,5-bis(trifluoromethyl)phenyl]-1H-tetrazole (Activator 42), 4,5-dicyanoimidazole (DCI), certain carboxylic acids, and various acid/azole complexes such as benzimidazolium triflate (BIT) and saccharin 1-methylimidazole (SMI).